Current and future hydrologic variability is a major driver underlying large-scale management and modification of inland waters and river systems. In a climate-altered future, identifying and implementing management actions that mitigate anticipated flow regime extremes will be an important component of climate adaptation strategies. These concerns will be particularly focused on extreme flows (floods and droughts) that have ecological, social, and economic importance, and whose impacts are inversely proportion to their frequency. Climate warming is expected to increase the frequency of extreme precipitation. It is critical for natural resources conservation that responses to these risks incorporate ‘green’ infrastructure which potentially benefit both ecosystems and human infrastructure. An overarching strategy of ‘slow the flow’ is increasing transient and long-term storage in upland/upstream compartments (soils, floodplains, headwaters, beaver impoundments) to increase resilience to both floods and droughts. 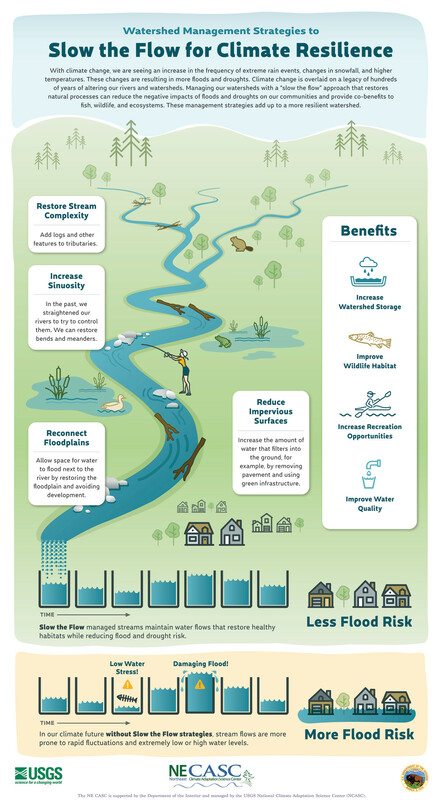 These alternatives do not only reduce flow variability, they also have the potential to generate substantial benefits for species and ecosystems by restoring floodplain connectivity and converting impervious surfaces to forest cover. Evaluating the potential benefits of green infrastructure on climate resilience presents technical challenges and requires an understanding of the diverse array of stakeholder perspectives and needs. This project assessed the capacity of green infrastructure to provide multiple dimensions of climate resilience, focusing on extreme precipitation (floods and droughts), their immediate consequences (eutrophication of receiving waters), and their implications for major management initiatives (dam removal, stream channel and river habitat restoration). Our objective was to provide decision support, based on the best available science, allowing managers to identify effective strategies for flood and drought resilience in the context of a changing climate, at both local and landscape scales, and along multiple ecological dimensions. This research helped to design climate-resilient landscapes that achieve multiple objectives and serve both ecosystems and human communities. Research efforts were focused on four case study locations (Connecticut River basin and Ipswich River basin in the northeast, Lake Michigan and interior Wisconsin tributaries in the Upper Midwest), but results will be broadly applicable at national and even international levels. The work was led by the project team consisting of co-investigators from the University of Massachusetts, University of Wisconsin, Marine Biological Laboratory (MBL), College of Menominee Nation (CMN), US Geological Survey and USDA Forest Service. Project partners included The Nature Conservancy (TNC), the US Fish and Wildlife Service, and participating state natural resource agencies. McIntyre presentation at SlowTheFlow workshop in Lansing MI, 10 Oct 2018. Mooney et al. presentation at the Mississippi River Research Consortium meeting in La Crosse, WI, April 2018.